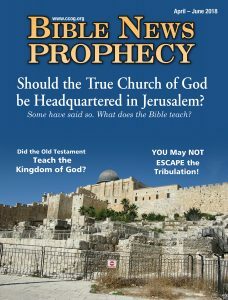 BibleNewsProphecy: Should the True Church of God be Headquartered in Jerusalem? We are pleased to announce that our latest magazine is now available online. Here is a link to the April-June 2018 edition of Bible News Prophecy magazine. 3 From the Editor: Should the True Church of God be Headquartered in Jerusalem? Some have said so. What does the Bible teach? inherit the Earth or Heaven? of the Kingdom of God from the Hebrew scriptures? five decades ago—but the message is even more timely today as we are closer to the Great Tribulation. This entry was posted on Saturday, March 31st, 2018 at 3:00 pm	and is filed under COG News. Bible News Prophecy magazine, Apr-Jun 2015: How Will Middle East Peace be Brought About? BibleNewsProphecy, April-June 2016: Did Early Christians Keep the Spring Holy Days? BibleNewsProphecy, October-December 2016: Should a Christian Vote?